I have been associated with Raptivity for a long time now. Working as a User Experience Expert, my job demands to conceptualize means and ways that enhance a user’s experience with Raptivity. With this objective in mind, I have initiated many significant developments and changes in Raptivity. One such significant development has just been successfully concluded by the Raptivity team. We have completely redesigned Raptivity’s User Interface. All this started a year back when as a focused effort to improve Raptivity user experience, the Raptivity team started collating users’ opinion about Raptivity. Their usage patterns were studied. Alongside, eLearning industry experts’ reviews on Raptivity were also initiated. Once everything was ready and studied, I sat with my team to layout the design for the new user interface. As a part of this redesign many things have been simplified. The reason for this redesign? Well, you guys would know it the moment you see it. Everything in the redesigned Raptivity now focuses on and leads to – 'Task efficiency'. Users can now easily locate and use the required features, get to a point in fewer clicks, resize elements easily, and do much more, thus highly improving their efficiency and productivity. I am gonna showcase a few screens just to give you glimpse what we have done and how it looks now. Earlier: Locating interactions was 3 steps away. Now: You can locate interactions in a single step only. Earlier: The customization panel was at the bottom of the screen which limited usability to some extent. Now: The entire customization panel has been shifted to a side. Additionally, we have provided the flexibility to resize it and move it from left to right or right to left. Apart from fewer clicks, we have focused specifically on improving the product help and search ability. 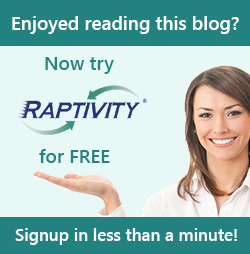 The redesigned Raptivity offers you a much better yet simpler product help. It is more dynamic and visual than before. Apart from that, users can get help for every parameter just next to the parameter name. The improved product search is a very welcome way to learn about additional resources like blogs, community discussions and videos related to the searched term. Activities like upgrading have been simplified and can be done from the product itself. With all this and much more, I am sure you must be eagerly waiting to try it hands-on. So here you go. Click here and download the all new chic, trendy and improved Raptivity. I am sure you are gonna love it. For any feedback, suggestions and praises do write to us at info@raptivity.com.